China "Yao Wang, Yue Wang"
As the oldest country in the series, China has seen a lot over the years. He's known for having a long history, the roots of Asian culture, and the largest population on earth. His hair is dark brown, but was colored as black in earlier artwork. Also in earlier artwork, his hair was short and he sported glasses. China raised Japan and treated him affectionately in the past. Japan eventually turned against him, and attacked him with a katana in the dead of night (which then started a war), leaving a large scar on his back. Hong Kong was also raised by China, but was later taken away from him by England. 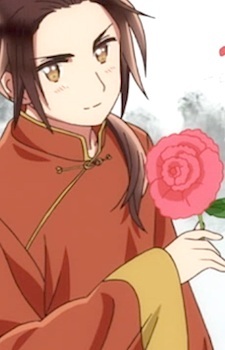 The two were reunited eventually, and in Hetalia Fantasia, Hong Kong was China's assistant and referred to him as "sensei." Korea refers to China as "Aniki" (Big Brother), and is somewhat obsessed with him. China is easily annoyed by his antics, and is prone to snapping when around him. China once mentioned to Japan that he has no "villas" (Chinatowns) in Korea because "building villas in Korea are simply impossible." A fan of Hello Kitty, pandas, and other cute things, China has a "friend" named "Shinatty-chan," who is an old man dressed in a knockoff Hello Kitty costume. In Shinatty-chan's first appearace, he was robbing China's house. He has a rather serious personality and is very superstitious, but can be immature at times. Food is known as being his first priority in life, and he even complains if food has a certain pattern of tastes and flavors. China is very artistic and can even paint a picture on a strand of hair, but is absolutely terrible at drawing anime and manga. Although he tries acting like a big brother to the other Asian nations, they never treat him as such. He ends almost every sentence with "aru," which is a Japanese stereotype for a Chinese accent. When around England, he is noted to end his sentences in "ahen," meaning "opium" (in reference to the Opium Wars). According to Hidekaz Himaruya, his first name can be rendered as either Yao or Yue in both English and Japanese (Yao is the more common moniker of the two in fandom). "Yao" in Chinese means "brightly shining." His last name, "Wang," means "king" in Chinese.